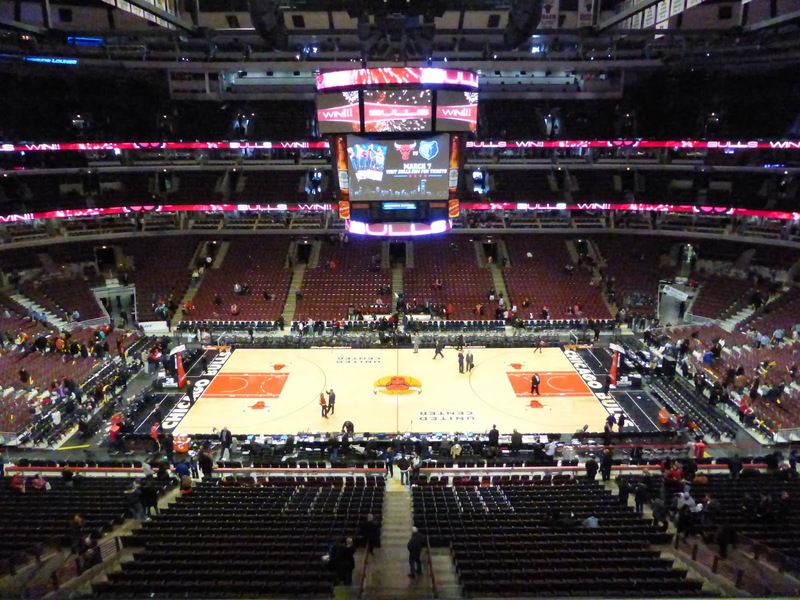 In 1991, I took a trip to Chicago to see the Bulls, Bucks, and Bears over a November weekend. Chicago was in the midst of a cold snap and I wasn't prepared coming from Vancouver; that Bears' game was the coldest sporting event I've ever experienced. Even then, it was still a great trip because I saw the Bulls raise their first championship banner in old Chicago Stadium. At the time, I didn't expect 5 more to join it in the rafters, but some guy named Michael Jordan had a pretty good career for the Bulls. 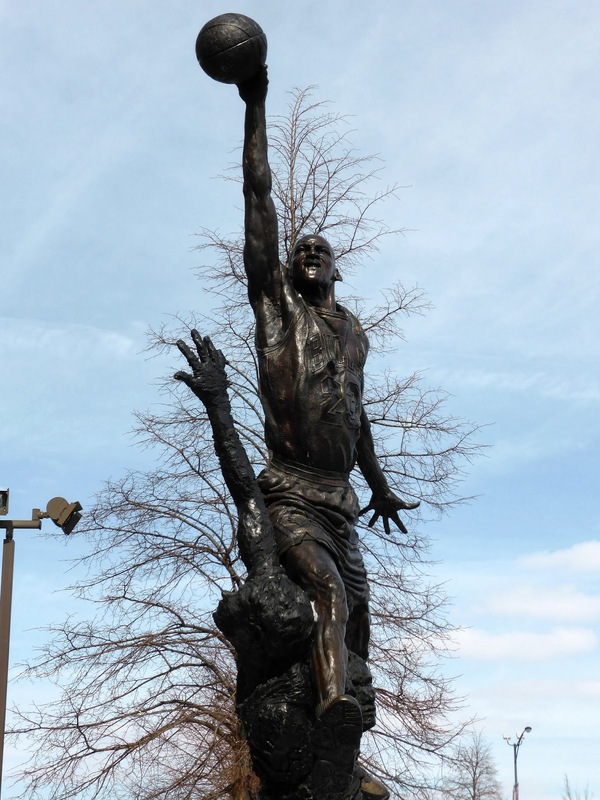 There's even a statue of him in front of the new arena, the United Center. 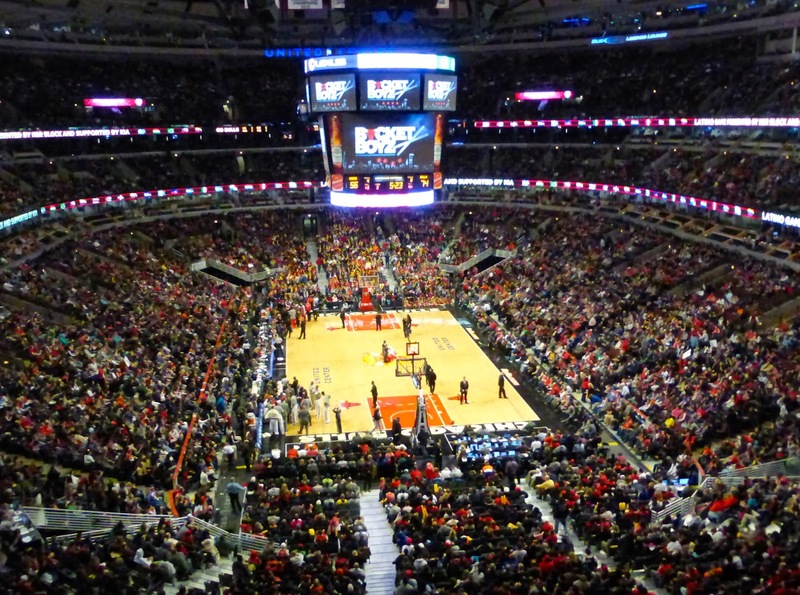 Although it opened in 1994, the United Center was still on my list of venues to visit to enter Club 122. I guess that 1991 trip scared me away from Chicago during the winter as I had only seen a couple of Blackhawk games in the past two decades, both in warmer months. This time, there would be no whining or wimping out; Club 122 beckons and I made the trip over the first weekend of March when the New York Knicks were visiting. After taking Amtrak from Milwaukee that morning and checking in to my downtown hotel, I looked for tickets on StubHub. There were baseline seats in the first row of the upper deck for $35 each, but only as a pair. I figured I could sell the other one at the stadium, so I bought both, printed them out at the business center, and headed out on the 'L' to Ashland. By the time I got to the stadium, it was nearing game time and I worried I was going to have to eat the ticket. Some friendly scalpers offered $10 but they scuttled away when a cop appeared. Fortunately, I found a guy willing to buy my extra for $20, which was good enough for me, and in I went. The view from my seat is below. It was Latin Day (a Latinee?) 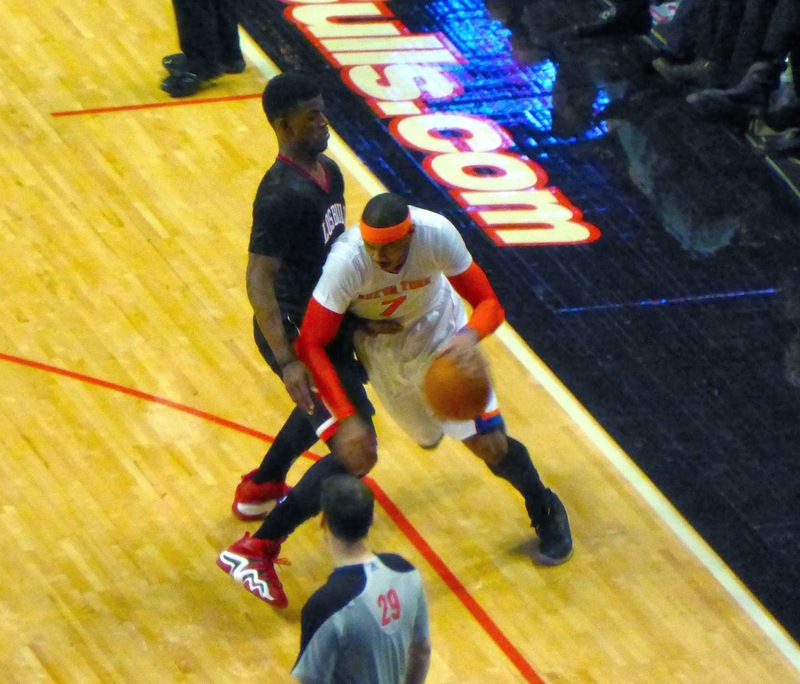 and both teams were wearing the new sleeved jerseys, with the Knicks donning home whites reading Nueva York, while Los Bulls were in black. A nice idea, and many of the timeouts and halftime show were Latin-themed as well. Even ESPN, who were broadcasting the game, got into the act, using the Spanish terms on their crawl throughout the day. The game itself was over before it started. Chicago burst out to a 16-1 lead and never looked back. 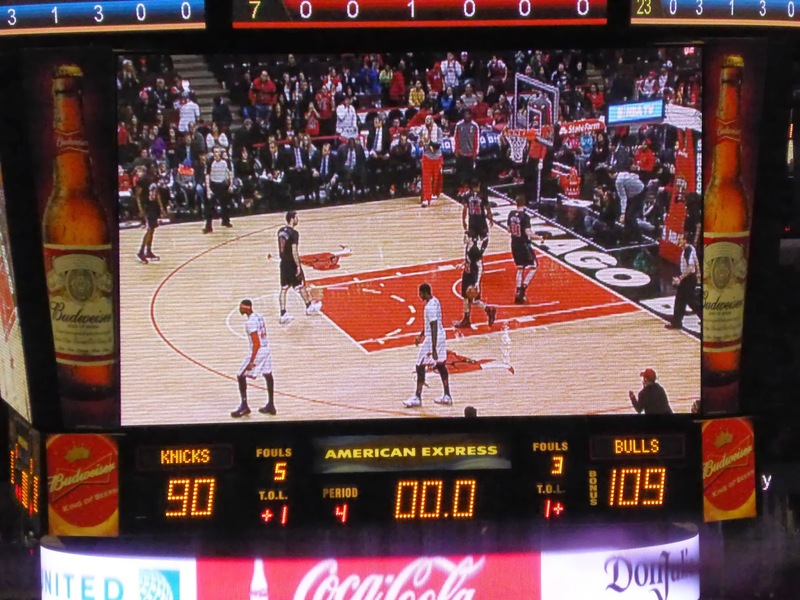 The closest the Knicks got was within 9 late in the third quarter, but the Bulls were never truly threatened, winning 109-90 in a game that I wanted to forget as soon as it finished. In fact, I am not sure why I am posting this. Joakim Noah had a triple double and was impressive to watch. The Bulls are suffering without Derrick Rose, but still a fun team, while the Knicks are excruciating. Mike Woodson simply has to go, along with about half the roster. Truly a team with no heart. The Bulls committed only three turnovers, a franchise record and just one off the league record, which has been accomplished three times, most recently by the Thunder one year ago. I can't overstate what a brutal game this was and suffice to say I will not be visiting the Knicks again this season. Nor should you. 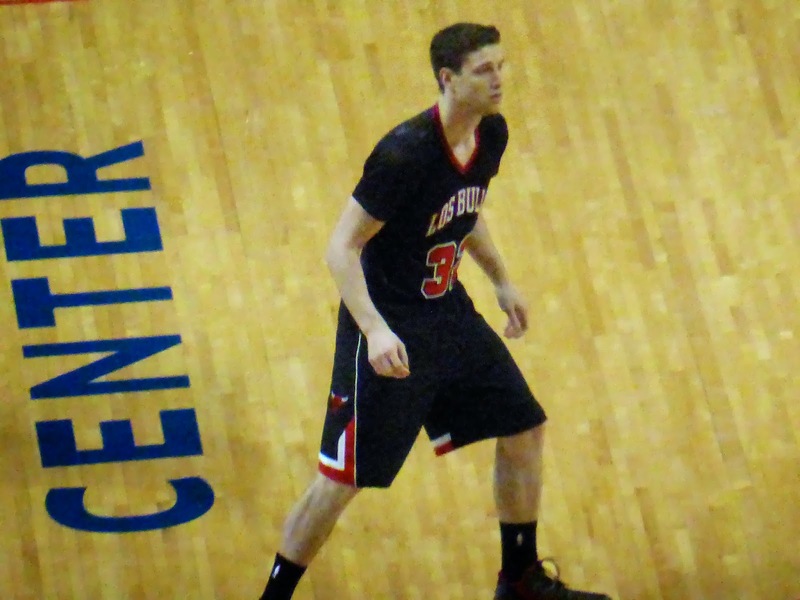 With time running out, Jimmer Fredette made his first appearance for the Bulls. Fredette was with the Kings when I saw them in New York just three weeks ago, a game the Knicks lost in overtime. He is a great shooter but his defense is questionable so the Kings agreed to a buyout and Fredette signed with the Bulls. Be interesting to see if Tom Thibodeau turns him into a better defensive player. Not only was this venue 119 in Club 122, but 475 overall. The Leafs are back in New York on Wednesday to take on the Rangers and I'll pop in to check that out, hoping to see them get their first post-Olympic win. The upcoming weekend is in flux, depending on what happens with college basketball and hockey tournaments in the area. Then next week I'll head to Raleigh to check off the 30th and final NHL rink as the Sabres and Hurricanes do battle. That trip will also include a basketball game in Washington, an ACC tournament session in Greensboro, and even Duke baseball, before finishing with another Leaf road game, this one in Washington. Check back as always for more recaps.